Once in a while, your boss will come to you and say something magical. Something like "Anna, (or, you know, your name) I need you to make some muffins to be thrown into the pool every night." These are the moments when you think 'I have found my true calling in life.' If you work in theater, and you don't have these moments occasionally, you should probably start thinking about a job that pays you in real money. To be fair, these muffins are being thrown 'into the pool' which actually means upstage. There isn't really a pool on our 'Ten Chimneys' set, so I didn't have to make these muffins waterproof. I decided that I wanted to make the muffins out of Smooth On Flex Foam-it X because it's light, durable, and really fun to make things out of. Most importantly, if I made soft, nerf-like muffins, we could have muffin fights in the shop. The first thing I did was to try out the material. I grabbed an old muffin tin, one that I won't use again, and gave it a good coating of Universal Mold Release before mixing and pouring some of the Flex Foam in and letting it cure. As you can see, above, the expansion is pretty good, but the smooth, shiny tops of the muffins aren't very convincing. So, I needed to think of something to sprinkle on the top of the foam while it was curing. The first thing I tried was crushed cork which I've used very successfully as crushed nuts in the past. 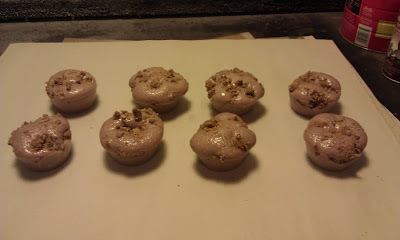 This worked really well on the muffins, or, it would have if I wanted the muffins to look like they had Grape Nuts sprinkled on top. Back to the drawing board. After a bit of thinking about tasty, tasty muffins, I decided that a streusel top would be the way to go, so I set out to make a good fake streusel topping. Real streusel is made of butter, flour and sugar. My streusel topping is made of sawdust and flex glue. 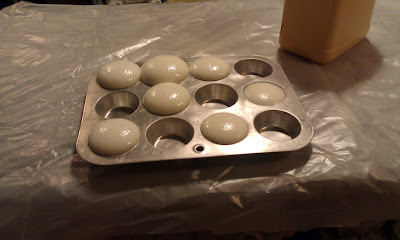 I also tried corn starch, but it didn't work as well, and I was worried that little micies would eat it in storage. 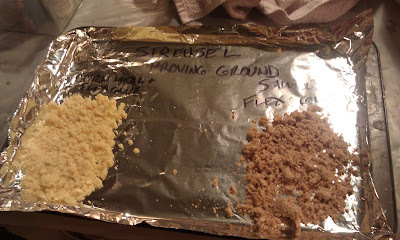 To make the streusel, I just sifted some sawdust and slowly stirred in flex glue until the topping was the right consistency. I let it dry over night before it was ready. 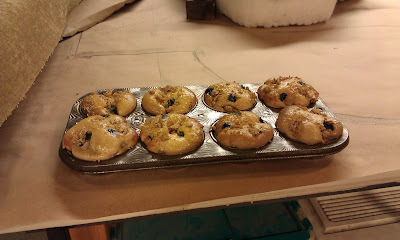 When it came time to pour the foam, with a drip of brown tint in it, I waited until the foam was starting to rise, and I sprinkled some streusel onto each of the muffins. The texture came out just as I'd hoped, but the muffins needed a bit of paint. I used a combination of Design Master sprays and acrylic paints to finish the job. I'll admit, painting isn't my forte, but I think these are passably muffiny. I used hot glue to secure the muffins into the tin. I also bent a piece of aluminum wire to fit inside the lip of the muffin tin. I glued it onto the tin, in hopes that it will help protect the edge from all of the flinging that's going to occur. So that's that. Whipping Muffins. Oh, and by the way, my computer kept trying to replace 'streusel' with 'stressful,' and that amused me. Happy Propping, y'all. 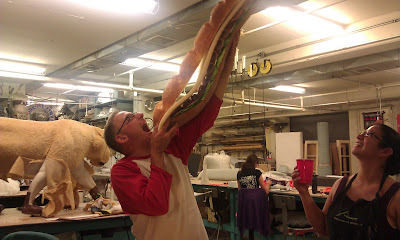 My Hero the Hoagie, a Submarine tale. So, it is possible that some of you may noticed that I haven't posted in a while. Yup, the summer got away from me. 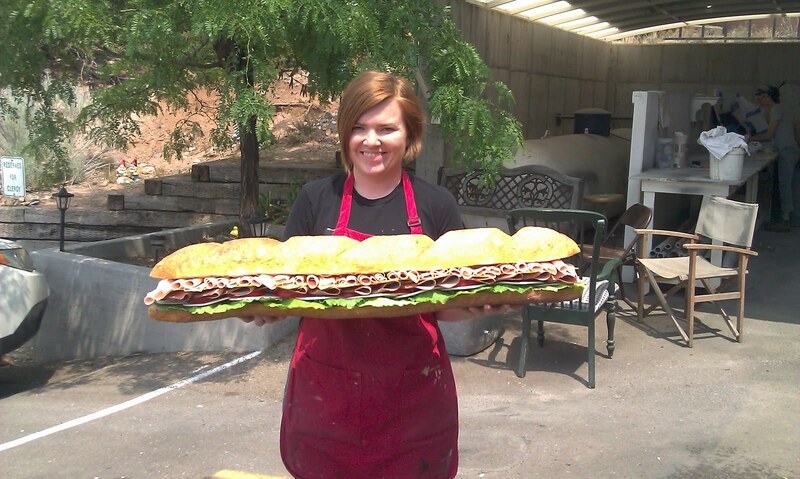 To make it up to you, and long post about a long sandwich. Enjoy. When you think Opera, you think elaborate sets, elegant costumes, tremendous music, and giant hoagies. Well, maybe you don't, but the good people putting on 'The Last Savage' sure do. 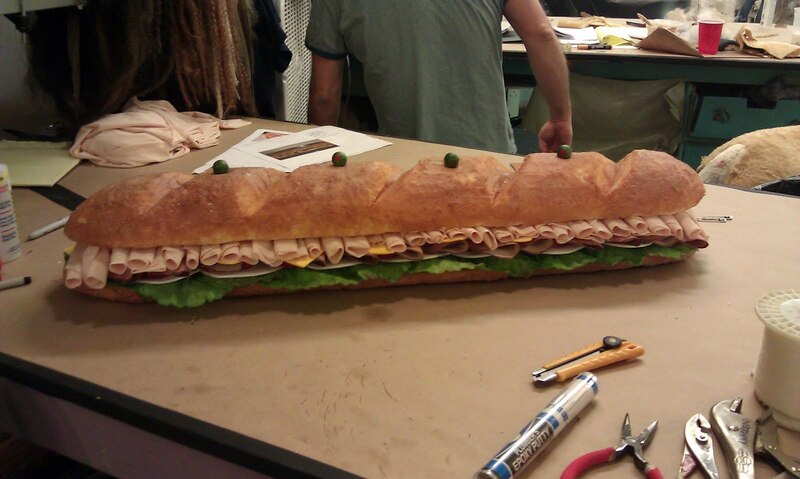 When our Master Craftsman was going through the to-do list, and said 'four foot hoagie' I volunteered immediately. Well, okay, by volunteered, I mean that I squeaked like a chipmunk and clapped my hands. It worked, I got to make the sub. 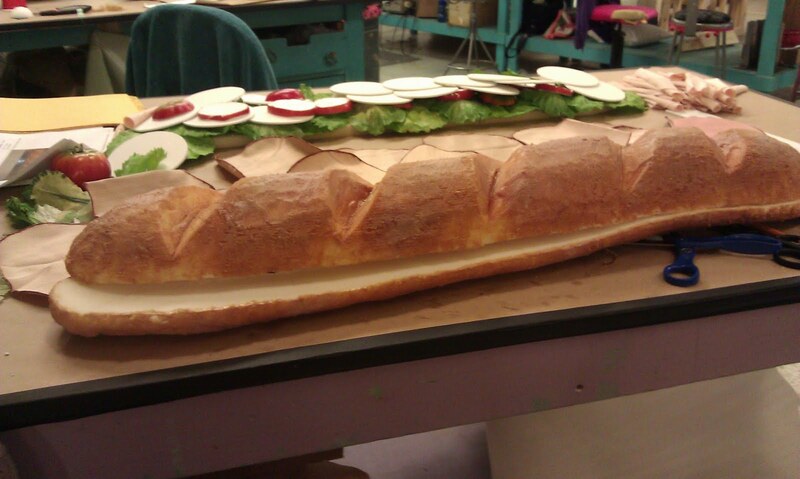 It ended up being only a three foot hoagie, in order to fit in the trunk, but who am I to question? 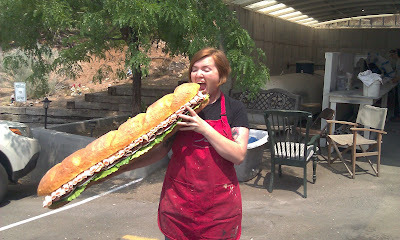 So, what do we need to make a sub? Well, in this case bread, lettuce, tomato slices, cheese, ham, turkey, and olives, or, actually, reasonable facsimiles thereof. Let's start with the bread. I used upholstery foam to make the bread, and I learned a few new tricks while I was doing it. The first trick is a way to keep your Olfa blade sharp while carving foam. I heard about it a while ago, but didn't really put it to the test until this project. The trick is simple, just put a little bit of oil onto your blade, I used the oil that we use to lubricate our industrial sewing machines. This keeps the blade sharp, which makes the cuts cleaner. 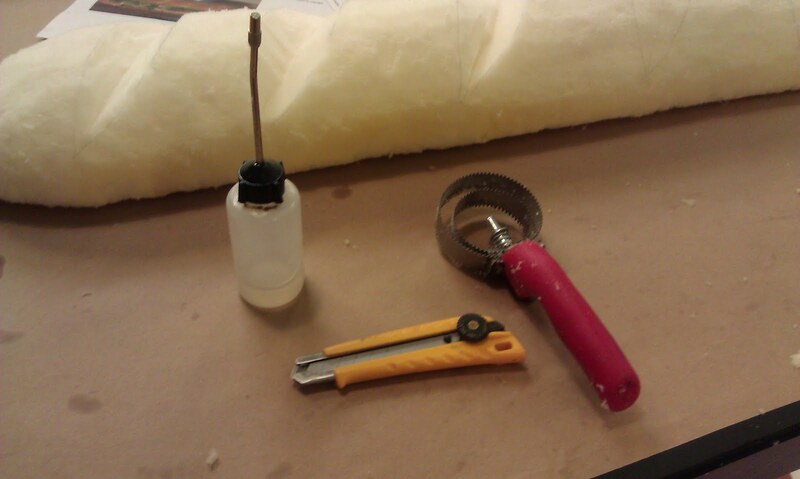 The second trick is to use a tool called a curry comb to carve the foam. The curry comb's sharp teeth carve the foam well, but they can also leave grooves in the foam- so beware. Once the bread was carved, I coated the foam in some old liquid foam latex that we had laying around the shop. The dark color actually ended up being perfect for the fresh baked bread look. I love it when that happens! So, next up would be toppings. I haven't yet found a good way to make fake lettuce, so when I need lettuce, I just go for the commercial stuff. I wanted to secure the toppings together, so I cut a piece of canvas, and stapled the lettuce leaves to the fabric using an office stapler. Quick, easy, and effective! As for tomato slices, this time I went commercial there too. I grabbed some fake tomatoes from our stock, and sliced them with a bear saw. Since the other toppings were covering the tops and bottoms of the tomato slices, and only the edges were showing, it wasn't necessary to paint the top and bottom. Then, for the cheese! Now, as I am from Wisconsin, you all know that I'm pretty serious about my cheese. That's why this sandwich has two types of cheese, provolone and cheddar. Both are cut from fun foam, that stuff you buy in sheets at the craft store. The foam is pretty good for the cheddar, but a little too opaque for provolone. Again, the fact that the provolone will be mostly covered is helping me get away with this. 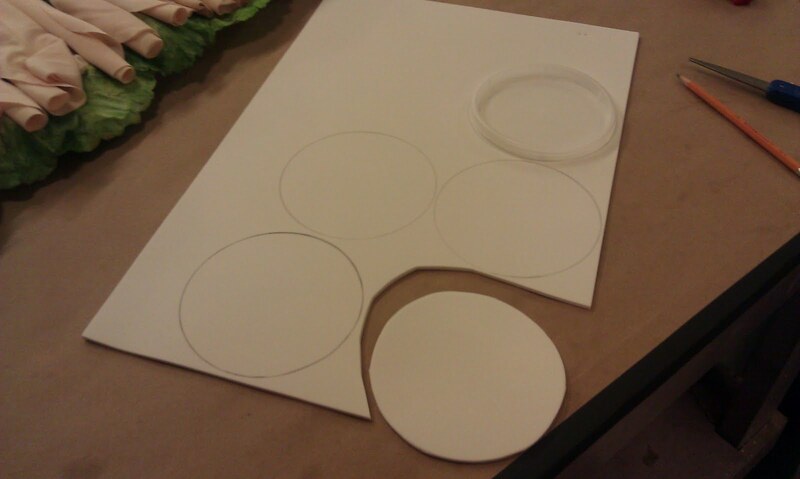 Oh, as you can see, I used a plastic lid to trace the circles out. Resourceful! So, next up, ham! 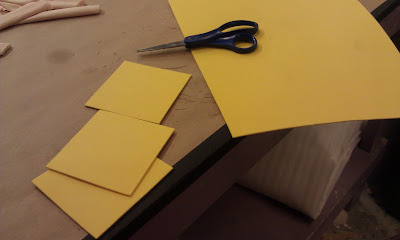 I really wanted to use materials that were already available in the shop (the budget was tight this season) and I also wanted to get the prop done in a reasonable amount of time. Now, I've made ham slices before (see Hammy Sammies) but that process was pretty time consuming, and I wanted to bang this bad boy out. 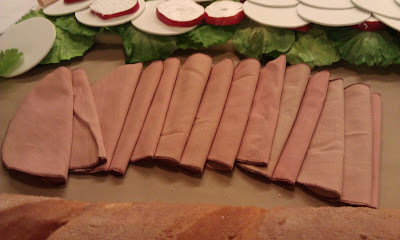 Luckily, we had some pinkish fabric in stock that worked really well as thin sliced ham. I cut the fabric into ovals, and hit the edges of each with a brown Sharpie to give it a rind. The turkey slices were also fabric from stock. We had some light colored spandex that was just the color of deli sliced turkey. Again, I cut the fabric into circles, but I rolled these cold cuts into tubes to give some variety to the sandwich. Now, you maybe be asking yourself 'Self, what are those bits of ethafoam rod doing on that sandwich?' Well, I'll tell you. 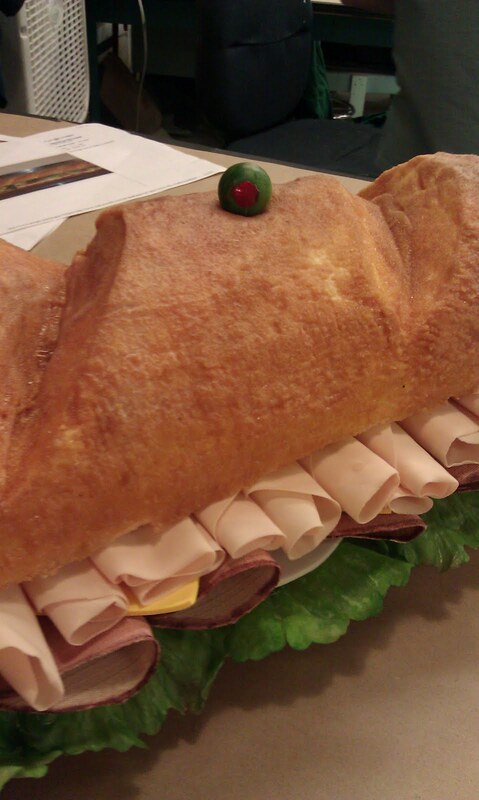 Once the ham and turkey made it onto the sandwich, the weight of the 'bread' was pressing down on them, and the were losing their shape. 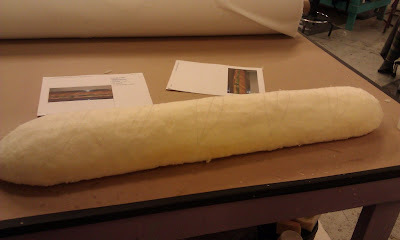 I cut short pieces of ethafoam rod, and carefully glued them (with low temp hot glue) into some of the turkey rolls and ham folds. It boosted the sandwich slightly, but was not easily seen. Assembly was mostly done with low temp hot glue. It wasn't my first choice, because I was worried about it degrading in the heat, but it was the only thing I could find to stick to everything. 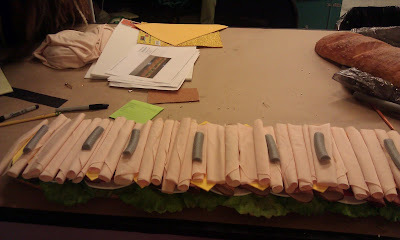 Everything was glued to the lettuce/canvas staple combo in order. 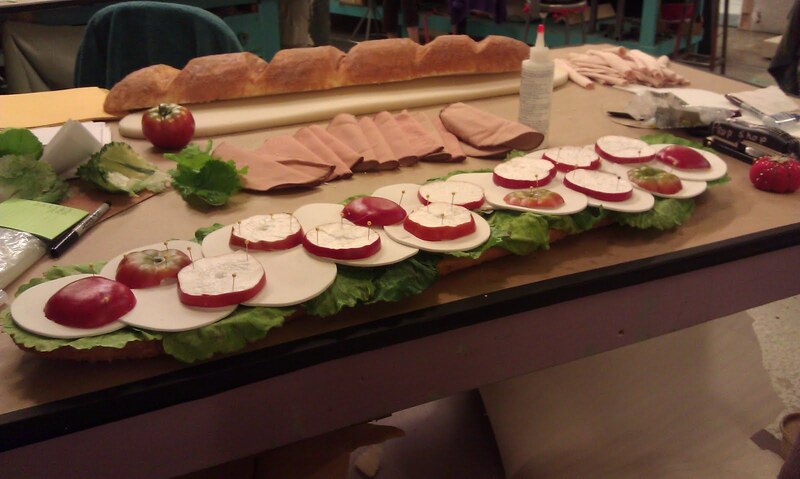 Then, I used a contact adhesive similar to green glue (3M Fastbond) to attach the bread to the fillings. It wasn't a perfect adhesive, but it did seem to work. For good measure, I decided to add a mechanical fastener as well. 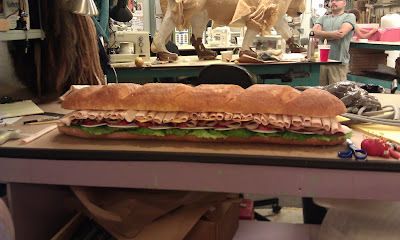 I used a tufting needle and monofiliment to tie the sandwich together at four places. That's what the olives on top are for! Each one is a wooden bead that I used as a tie off point. Then I stuffed the ends with plumber's epoxy (paper clay is lighter and cheaper, but takes longer to dry. No time!) and painted them to look like olives. 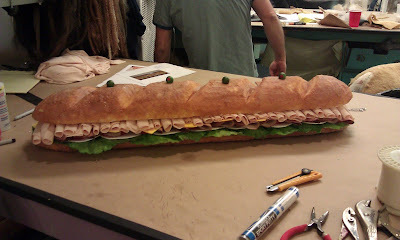 Tips for tufting a sandwich? Wear safety glasses and use a leather tufting needle. The blades will help you cut through the foam more easily. So there it is, WAH-LAH, as they say in France. Want more? Okay, one more pic, just for you. My boss enjoying the sandwich.